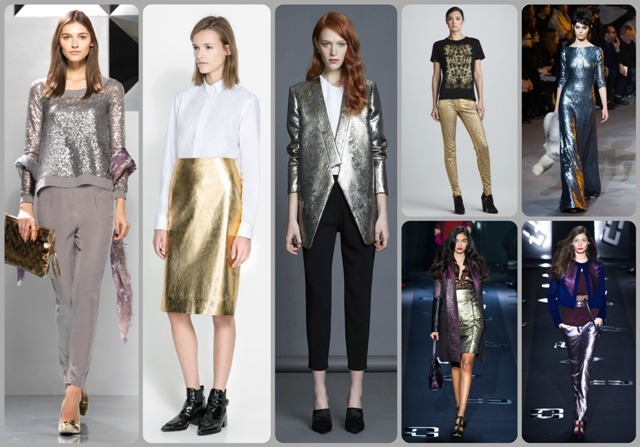 We end our Fall Fashion Fabric Guide series with a bang… or shall we say with bling – metallics! Let’s face it, women are always going to gravitate towards the shiny and pretty. Sophisticated pieces of lamé, silks, brocades and jacquard were heavily represented on the runways this year, ranging in silhouettes from 60s-inspired to ethnic chic. Even everyday items are fused with the trend, as seen with Tee and Cake’s silver metallic sweatshirt, Zara’s otherwise traditionally professional gold metallic pencil skirt, and metallic sheen jeans and leather pants by varying big name jean brands. Metallic fibers are very delicate. Most garments made from these materials are highly susceptible to damage from the repetitious rubbing associated with washing and drying machines and will need to be dry cleaned. Perspiration and other moisture may cause the fabric to tarnish, therefore, should not be exposed to weather precipitation or heat conditions that may cause the wearer to perspire more than usual. Brocade, jacquard and damask fabrics have raised patterns, so take care not to crush or warp the design by being seated for long periods and avoid jewelry that can catch and snag. Well, that covers it. If you need a refresher on what’s fashionable this season, and how to take excellent care of your favorite fabrics, please follow the links below. We hope you found this guide useful, and remember that Sudsies specializes in intricate garments, including all the trends cited in our Guide. Now, time to get shopping…Art Basel Miami is quickly approaching!